Busy routines divert attention from other important things. People who are working in offices have piles of works to do. Similarly, many other ones are working in different places where they don’t even find time to have their meals just because of working burden. Their minds remain busy for the whole day and they forget to perform other necessary tasks like paying the bills, attending wedding ceremony, arranging meetings, planning for weekend and so on. For this purpose, we need a reminder which can release the mental stress of keeping work to do. Reminders are designed to work in android, iOS and window devices where it work smoothly and help you to remind all essential tasks of our daily life. You will not face the problem of forgetting your tasks every day due to busyness. Download the reminder in android, iOS and window devices and add your tasks to which you want to keep remember. Reminder apps will not let you to forget your daily tasks and will remind you on time. Whether it is wishing birthday to someone, important call, paying utility bills, and other important event these reminders app will not allow you forget. So, pick one app from the list that suits your needs and set reminder for the things that you want to do on time. The application has user friendly interface. It is simple in working and makes you remind those tasks which you are often forget. You can add your tasks and alarms related to them so that it can easily remind every task on time. Its a paid version free of ads application, you can use without any interference. It also offers its free version but there you will have to deal with ads and limited features. Its paid services provides access to all of its premium features to which you can customize like you can put reminders for making calls, doing mails and messages and calendars. Add as much reminders as you want to do and get notified by means of BZ Reminder Pro application. Give different colors to your tasks to make them attractive with app’s features. The application has smart watch support. You can set your reminders within phone and connect your phone with the watch so that you don’t have to keep phone everywhere. The application offers you highly organized features like if you want to make calls but usually forget, make a reminder using this app and it will inform you by alarm that it’s the right time to make call. Similarly, you can do other tasks like mail, messaging, wishing birthday, sending files and data with this alerting application. You can also set reminders with short time intervals like after every hour and add snooze with it. Rembo is available in English language so that everyone can use it very easily. You can organize your list in which you can add multiple tasks by using calendar so that the app can reminds you your work. The application is free to install and you can use it easily in all smart phones. The application has many customizable features according to your requirements that will not allow you to forget important tasks. It can make you remind every task which is hard to remember. Using the app, you can make easy access to your tasks and also add list of widget on the home screen. You can select size and types of widget by the app easily. Customize dates, day and time of the reminder and add your plans in the app. It will remind you accordingly. You can also make lists, folders and add tags with their classification so that you can get it easily. Make upto 5 notifications of a single task and organize it by adding date, day and time. 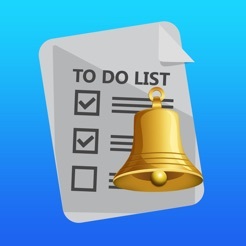 The to-do list app enable you to make your tasks lists which you want to perform. Set reminders of every task so that you won’t miss your meetings, parties, calls and emails you want to make. Wunderlist offers you to share your lists with family and friends and you can show your activities to them by means of this application. You can attach files, photos and documents by it and send to others. You can also organize your plans and projects using the app and keep them in different folders. The application is simple developed to set reminder for small tasks, user friendly and easy to install. You can do many tasks on time and fulfill your plans by this app. You can add multiple reminders with short intervals and add date and day so that you won’t miss your work to perform. It keeps you alert every time and help to remember birthdays, meetings, projects and even time to drink water very easily. You can add multiple notifications in a single reminder using Ike app. This reminder app has some smart features by which you life can become easier. It will remind you every task very easily. You can write a text message or compose a mail and using the app, select the time, date and day on which you want to send that message or email. The app will send you message on time and inform you by providing a notification. You can add multiple reminders also using this app so that you will not miss your important tasks. The application is designed to keep you alert for every task. It is synchronized with Google to customize your task list more easily. You can perform your task on time with this task management system. Add reminders related to calling, messaging, mailing, meeting and other tasks to perform and the app will remind you on exact time. Customize your task and set them on home screen so that you can make quick access. This is one of the powerful application enable you to create reminders. You can perform every task on time by using this app. Add your task in the list and put the notifying option on. It will inform you what you have to do in the respective hour. You can add multiple notifications related to single task so that you will never miss anything which you have to perform. Google Keep, developed by Google, application works smoothly to reminds you things on time. It can use images, files and related option of your phone to make you remember what you need to perform. Like if you have to send a snap, add snap in your reminder list which you want to send. It can work efficiently to in android devices and free to install app. Notin is a special application that reminds you things in a different way. Unlike others it did not irritates you with alarm on every. Notin perform things differently, it creates reminder direct into your notification drawer that to-do list always remain in front of you and you did not forget things. The application works to memorize you those tasks which you often forget. For example, the tasks which you forget to do include attending meeting, making calls, sending message and even drinking water. Add reminders and make your list of tasks which you want to remember in your notification bar and the list will always be in front of you.